The Panhard 178 is a 4x4 armored car which entered service with the French army shortly before World war 2. Many of these vehicles were captured by the Germans after the invasion of France. The 178 was found to be a sound and reliable design and was pressed into German service designated Panzerspahwagen P204(f). These armored cars were used throughout Europe and in the Soviet Union by German forces for anti-partisan and security duties. Many were converted for use with armored trains their tires replaced with flanged steel wheels and were used to scout the tracks ahead of trains. After the Liberation of France in 1944 production was resumed for use by the Free French. At the request of General Estienne and on the basis of previous studies worked out by Renault, Schneider, FAMH, FCM, and Delaunay-Belleville, a new battle tank was developed under the code designation of "Tractor 30". In 1929-30, three pilot models were built by Renault and FCM. These later became designated Char B. These three pilot models were extensively reworked and modified for tests. The first one, reengined and uparmored became the early prototype for the B1-ter in 1937. The Char B1 was the production version of the Char B. Production began in 1935. Only a small number were built before construction changed to the more powerful B1-bis. The B1-bis was the main battle tank of the French army in 1940. Considered one of the most powerful and advanced tanks in the world, it was hampered only by it's low speed and cost of production. The B1-ter did not go beyond protype stage. Had the B1-bis been better employed, it would have easily defeated any invading German tank in 1940. The SAu 40 SPG was initially the ARL V 39's counterpart for the DLMs, the Cavalry's armoured divisions. 36 vehicles were ordered on the same day as the ARL V 39 (24 SPGs and 12 command vehicles, organised as the ARLs) but this was cancelled on 1 May 1940 because of teething problems with the new 75mm "high power" APX gun and in order to standardise production on the ARL design. Instead, 72 SAu 40s were ordered as tank destoyers, armed with the 47mm mle 1937 (the same gun as the Artillery's 47mm ATG). None of these were produced but it appears that the SAu 40 prototype above saw action in an improvised unit in June 1940. Designed as a self-propelled gun for the DCRs, the Infantry's armoured divisions, 72 ARL V 39 (including 24 unarmed command variants) were ordered on 15 October 1939 to arm 8 battalions each with two batteries of 3 vehicles (two battalions per DCR). On 9 May 1940, the order was increased to 108. The ARL V 39 was to have 50mm armour and be armed, like the SAu 40, with a new "high power" APX 75mm gun of which only two prototypes existed, both mounted on the SPG prototypes. None were produced other than the single prototype, evacuated to Morroco and abandoned there. Made by Renault, the UE supply carrier (named Chenillette d'Infanterie type UE) was loosely based on the Carden-Loyd Mark VI carrier. Carrying a crew of two and no armament, it was used primarily for supply transportation, often towing a tracked trailer. The captured vehicles were used by the German army, also by the Free French. Many variations were developed. The design of this tank started clandestinely when France was still under German occupation. After the Normandy landings, the French restarted their war industry. Production was carried out by both FAMH and Renault under the parentage of the ARL. 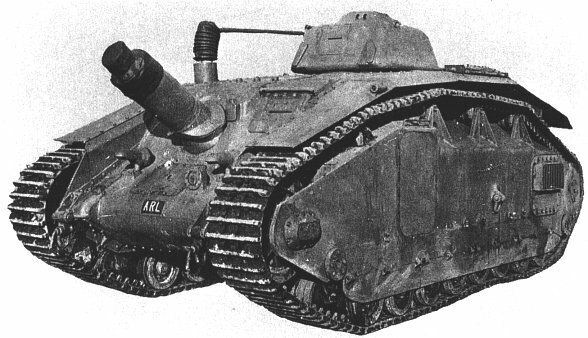 Christened 'Char de Transition ARL-44', the ARL 44 was based largely on the pre-war Char B1 bis. The first unit became ready only after the war had ended in 1946. The new French heavy tank came equipped with a 90mm cannon housed in a Schneider turret powered by a Simca traversing gear. The ARL 44 used the same tracks as the Char B1 bis, but were protected by skirting plates. Only 60 units were ever produced. Edited by Mig Eater, 09 April 2005 - 07:48 PM. This was a first quick patch, even before i read Rygar's Goodbye. I'm off in less than half an hour, but i'll try to get it done tomorrow. Designed in 1936 as a replacement for the D2. The design was rejected in 1940. Edited by Mig Eater, 21 April 2005 - 12:19 PM. just curious , but is it known how powerfull the prototype 75 mm APX cannons were ? compared to the heavy guns of the other countries for example . also , shouldn't the B1 be used as a heavy tank , the S-40 (or other) used as a medium , and the ARL-44 then used as a secret tech tank ? Edited by wilmet, 10 June 2005 - 11:38 AM. Secret Tech has mostly been removed from MP, partly to make room for France. or am I thinking about code red ? where are my brain pills ? On the night cabinet, next to the XTC and the Viagra..
That was pretty good for that time. Remember most early war tanks didn't have more than 50mm armor. Ok, compare it to the german 88 and it's a laugh, but besides that. What was the date of those figures Wilmet? I ask as Sabot rounds (developed a bit later in the war by the Brits) were much better at penetrating armour than conventional rounds. AFAIK, most of the French tanks featured here would not have had access to such rounds, and in light of that are actually pretty good in performance terms. this has better info than the site I was on before. It seems to be late 1939- early 1940 in terms of the date , using HE rounds (maybe not the best against tanks compared to other ammo types). this is for the ARL-39 though , so I dunno if this is what the Sau-40 would be using. (a guy called David) Even in 1940 the '75' in its normal configuration has been used in an AT task, even more and more when units had to deploy in hedgehogs. The studies led by Brandt in 1938/1940 aimed to increase the initial velocity of the shells (without increasing of the chamber pressure) and also more generally to increase the AT power of the shells. The French company developped a serie of sub-calibrated shells for the 25, 37, 75, 155 and 203 mm calibers (the two last ones for the French navy). The other nations did not developp similar or equivalent systems before 1941/1942. The most outstanding realization of this serie is probably the 75/57 mm shell with a muzzle velocity of 900 m/s and a penetration of 90 mm armor at 1000 m at an impact angle of 35° ... The 75 mm Mle 1897 guns could have engaged and destroyed German Panzer IVs at 2500 m with it ! But with the standard 1910M "breaking" shell the panzers were generally engaged/destroyed at 800 to 1000 m.
Except the sub-calibrated shells, Brandt also developped a 75 mm HEAT shell at this time, using the patent of the swiss Mohaupt. The tests took place in Bourges in 1940 and the results were that impressive that they were put in the secret immediately. The war ministry allowed Brandt to give the exploitation licenses to the USA and the United Kingdom. The sub-calibrated shells are used in the UK to developp the APDS shells (armoured piercing discarted sabot) issued from 1942/1943. The first AT guns using them were the 6 Pdr and 17 Pdr AT guns. Edited by wilmet, 12 June 2005 - 05:49 PM. thanks for clearing that up that canon has some pretty good stoping power then. If it had ever been taken into production, it would have had. Only 2 prototypes had ever been build. I wonder exactly how many ARL-40 (later known as ARL-44) were produced before VJ DAY. Also you have got to know that only the full production was carried out near 1948. To my best of knowlage none were produced before VJ Day. The ARL-44 was designed during the war, but never build.